This book examines some of the key issues around violence at work which have emerged in the new millennium, including the events of September 11th 2001 and other terrorist-related incidents, identifying these as an extreme form of workplace violence. It builds upon the expanded typology of workplace violence in Violence at Work (Willan, 2001), and identifies four types of workplace violence: intrusive, external violence including terrorism; consumer/client-related violence; staff-related violence; organizational violence. 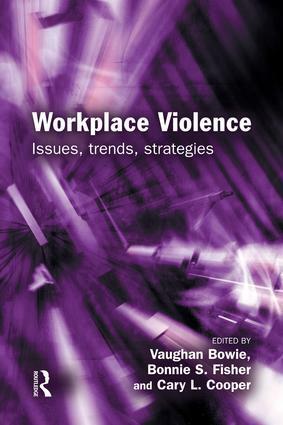 This book also addresses some key emerging and controversial issues facing those concerned with workplace violence, including staff who abuse those in their care, domestic violence spilling over into the workplace, violence against aid and humanitarian workers, and organizations who are themselves abusive to their staff and service users as well as oppressive of their surrounding communities. Workplace Violence goes beyond the current emphasis on equipping 'primary responders' (e.g. police, fire ambulance, etc) to react to terrorist-related and other workplace violence incidents, paying attention to the 'secondary' responders such as human services workers, managers, human resources staff, unions, occupational health and safety professionals, humanitarian aid workers and median staff - and their training and support needs. Domestic violence and the workplace: do we know too much of nothing? Caring for those who care – aid worker safety and security as a source of stress and distress: a case for psychological support?